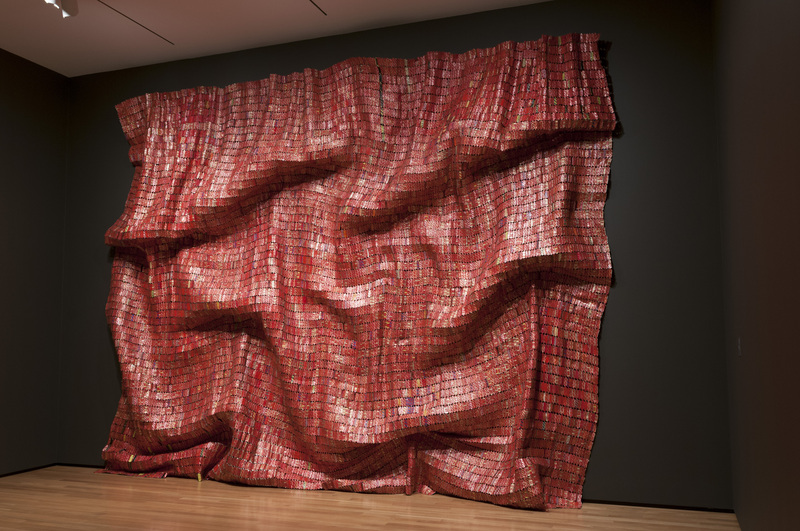 Kwame Anthony Appiah, philosopher on El Anatsui’s ‘Red Block’ sculpture. KAA First of all, I love it. It’s part of a sequence of many works that he’s invented in this form. He’s essentially a sculptor but from a distance these could pass for paintings. They’re made from small pieces of found metal, mostly bottle tops, stitched together with copper wire. The amazing thing about them is that they’re metal and solid yet from a distance they look like cloth. They’re very fluid and flowing. The interest is in the fact that they are actually just quite beautiful. I know recent art theorists have thought that beauty is overrated and I agree that there are many other things than beauty that matter in the arts but this does that thing of grabbing and holding your eye that I think is so important in the visual arts. It’s beautiful and it’s interesting because it’s metal but looks like fabric and suggests different materials as you come closer to it, so it’s between something three dimensional and two dimensional. The first time I saw one of these pieces was at the Hayward Gallery’s Africa Remix show. I thought it looked liked kente cloth, which was invented about 11 miles away from where I grew up in Ghana and is one of the most distinctive Ghanaian cultural artefacts. I went up and saw his name and thought, “He can’t be Ghanaian, that sounds like an Arab name.” Then I found at that not only was he Ghanaian, he’d studied art in my hometown when I was a teenager. So there’s this connection to a fabric that was central to my life. I felt I had grown up when my father gave me my first kente cloth to wear. It has all these private associations to me. GB Why did you pick Red Block in particular? KAA I saw it for the first time a couple of weeks ago and there were other more multi-coloured ones. Then there was this one and a black one. This particular red has private associations because this dark red and black are the two major colours of mourning. GB Do you think that people who know Africa and Ghana get something out of the work that other people in Brooklyn weren’t getting? KAA I think the connection with these cloths is much written about. I’m sure it’s in the catalogue so a moderately educated viewer would know about it. And kente is relatively well known in the United States because it’s become a sort of Afro-centric symbol. It’s always the case with a work of art that there are things that belong to it for any viewer and things that belong to it for each viewer. I’m sure there are resonances for people who are familiar with the fabric traditions, that wouldn’t be there for someone who isn’t, but as Eliot said, you can’t be universal without being particular. Anybody can grasp these issues about the way it is between metal and fabric, sculpture and painting. But a Nigerian might recognize the company that made the bottle tops. GB He talks about the bottle tops as a symbol of colonialism and the slave trade. Did it have that political element for you when you looked at it? KAA I know he says that, but I think of them as found objects. To me, nothing could be more Nigerian than drinking a beer these days and the fact that beer was originally a colonial import is completely uninteresting in comparison with the importance of the social act of Nigerians drinking a beer together. I think the idea of a global circulation is something that should strike any viewer. There’s nothing particularly Nigerian about bottle tops, although they do have a particular form of sociability around drinking beer. KAA He’s been an art teacher in Nigeria since the late sixties and the question of ‘where are we in relation to the global art world’ is a question that African artists discuss. He would have been involved in that. The departments where he taught and studied had many people circulating through from Europeans to Americans to people from other African countries, so they were a very cosmopolitan milieu. Then he’s not a Nigerian but has worked most of his life in Nigeria, so those questions of nationality, locality, African-ness must have been questions he thought about. This work comes relatively late in his career. Before this he was working with wood and chainsaws and other recycled materials. His work took off internationally because this later work managed to combine issues in the world art system with a set of references to African fabric in a way that meant you can talk about issues of representation in a general way while recognizing that the medium through which it’s explored has roots in a very particular place. GB Ever since Western artists started writing manifestos, they’ve really laid into beauty. Do you think that the fact this is from Africa means that it’s outside that Western tradition, so in a way we allow it to be beautiful? KAA That’s an interesting thought. I think that if you go to the Brooklyn Art Museum or the Hayward Gallery, you’re going with a very diverse audience. The Africa Remix show was probably the first exposure to contemporary African art for many people. So to have something immediately accessible, that has this impact on your eyes, was actually really important. Then it combines with the appeal of its beauty interesting questions about materials and representation, which allow the more self-consciously sophisticated audience to be interested as well. They may have excused its beauty because there were other things to say about it. I’m a simple enough person to be pleased by beauty. You don’t have to know anything about these objects to be struck by them. They’re startling, impressively attractive. They’re also monumental. Some are hundreds of square feet. They’re made with the help of a huge staff in his studio. That’s another part of the story, that they come from somewhere where people are grateful to work on these for a dollar or two a day. GB Do the comparisons to Abstract Expressionists like Mark Rothko make any sense to you? KAA The issue of colours and patterns and shapes that are not representational is an issue that goes back long before Abstract Expressionism. It’s even in these fabrics that were there in Africa before the colonial period. GB I’ve heard him talk in vague terms about a spiritual element. KAA I see that more in the earlier wood sculptures. People have worked on non-representational fabrics all over the world for centuries and for me that’s an easier way of looking at what’s going on. GB But I suppose that putting this in a fine art gallery context brings up these other associations because it was these kinds of lofty associations and intellectual interpretations that contributed to these abstract works having a huge commercial value. KAA Abstract Expressionism is part of what makes it possible for people to stand in front of these things and expect to learn something and enjoy it. “Why are we looking at this, it doesn’t represent anything?” is a dead question. I’m sure he’s taught Rothko and been involved in those discussions but that’s not part of my personal experience of it. GB It’s mostly sold to people who buy contemporary art and are familiar with the rhetoric of that world. It’s not decorative art to them. It’s not in a ‘museum of Africa’. KAA There’s an interesting story about this. There are two of his works in the Metropolitan Museum of Art. One is in the Africa section and the other is in the contemporary art section. They were acquired separately by two different curators. The first one was acquired by the Africa curator who asked the contemporary curators if they wanted to contribute but they declined because they didn’t know who he was. Then he was in the Venice Biennale and the contemporary curators approached the Africa curator to say they were thinking of buying one without realizing it was the same person. So in that moment when you move from being of interest to the Africa curator to being of interest to the contemporary curators is when your work suddenly becomes worth millions of dollars. There aren’t many people in Africa who could afford one of these. Practically no public museums have the resources to buy one. I think that his audience has been waiting for an African artist to invest in. The art world has been obsessed with identity for the last 20 or 30 years, asking ‘why don’t you have an African artist in your collection?’ So Abstract Expressionism is useful in preparing an audience for this kind of visual experience, only these particular works have what’s now quite an unfamiliar experience of beauty. They are deeply original. They have that mark of a masterwork, which is that they couldn’t have been done by anyone else. KAA I think Kant was right in that beauty is a word that belongs to sensation. It has to strike the senses, whether it’s the ear or the eye. And I think he was right in that it’s connected to pleasure in the sensory experience and the desire to return to the experience. But what is merely pleasurable is pretty. Beauty has an element of that thing that makes you want to come back, that engages you cognitively. It’s this combination of the power to attract the senses and then its being rewarding to think about the experience that you’re having that makes for real beauty.